"We are a relationship-driven financial services firm offering comprehensive financial planning, investment management and insurance services. We care about you, the individual with hopes and dreams, above all else. " Keating & Associates was founded by Patrick Keating in 1975. The first ever Keating & Associates facility was right here in Manhattan, KS! Patrick Keating believe that work should never be transactional but relational and that is the premise with which he founded K&A. The firm began in the insurance industry but quickly found that clients needed more information, support and services and thus expanded their services to be more comprehensive within the financial industry as a whole. In addition to expanding their services, K&A has also expanded their outreach with the opening of seven additional branches across the Midwest & Pacific Northwest. Keating & Associates prides themselves on their holistic approach to financial planning. They are focused on how every aspect of financial planning can impact their clients lives and the families of their clients. K&A takes on a diverse range of clients as well, ranging from fixed income & abundant wealth to those that have little to offer and everything in between. K&A's team is also composed of a wide variety of advisors, all well-equipped to serve the varying needs of any and all clients. After all, Keating & Associates believe that what sets them apart from others is their implementation of Core Values and dedication to individuals and the relationships they foster. Keating & Associates offers a wide variety of financial services to their clients and their services can be applicable to business owners & individuals. Interested in joining the K&A Team? Keating & Associates believes that their team is their most valuable asset and they will treat you as such. K&A is dedicated to providing their advisors with the freedom they need to grow their business, focus on clients and be the best advisor possible. Keating & Associates will continue to empower the amazing team they have created and are welcome to the addition of new advisors. 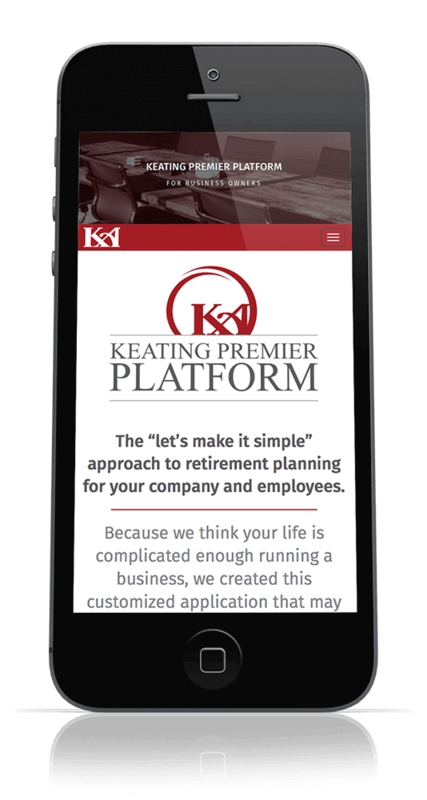 Visit Keating & Associates' Newly Re-Done Site!